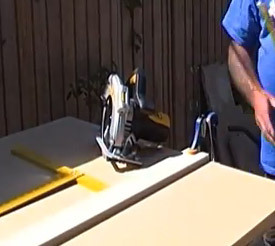 How to use a Circular Saw safely. In this guide find out how to use a circular saw or skill saw as they are sometime called, what different types of blades are available for different types of cut, how to cut a straight line and what power circular saw is best if you are looking to purchase one. Circular saws or skill saws as they are sometimes known are dangerous beasts but, handled carefully they are easy to use. The most important thing is to check that the blade guard is in place and you have a guide to run the edge of the saw along. This will ensure your cut is dead straight and you will not waste timber. The depth of a circular saw blade can be altered by loosening the sole plate (the metal with slides along the timber you are cutting) and lowering it. This has the effect of raising the blade. Remember to tighten fully when the blade is set at the required depth. To obtain the best results the blade should be set approximately 6mm (quarter of an inch) deeper than the depth of the timber. How Powerful Does my Circular Saw Need to be? As with most power tools, a circular saw with a wattage of less than 500W is a waste of time and will burn out very quickly under load. 750W is as low as we would like to go, but ideally a wattage of 1500 – 1750 is used. Timber can bind blades easily and a low wattage motor will not be able to cope. On a good circular saw, at the back of the blade, is something that looks like a rudder. This is called a riving blade and it is there to stop the timber closing on the blade as you cut through. The guide is adjustable and should be run along the edge of the timber as you cut. If the timber you are cutting is too wide to use the guide, then a straight edge of some kind should be clamped to your timber and the edge of the sole plate should be run along the clamped guide. 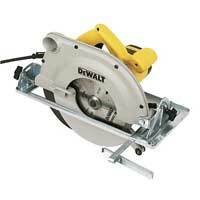 Blades themselves, as with hand saws, vary considerably and when it comes to circular saw blades this is no exception. A ripping blade (below) will have large teeth and be ideal for sawing along the grain of the timber. A fine cut blade (below) will have many, smaller teeth, and be ideal for cutting across the grain. The more teeth on the blade, the finer the cut and with a blade of 96 teeth you can cut laminates and veneers quite safely.